Federal Tax Form 4868 is a requisition for an automatic extension of time to file a U.S. individual income tax return. Individual tax return filing is mandatory for every US resident. Federal Tax Form 4868 is used to apply for 6 more months (4 if "out of the country" and a U.S. citizen or resident) to file Federal Tax Form 1040, 1040A, 1040EZ, 1040NR, or 1040NR-EZ. In order to qualify for the extension you need to accurately estimate your 2009 tax liability with available information and key in your total tax liability on line 4 of Federal Tax Form 4868. You also need to file Federal Tax Form 4868 by the usual due date of your return. The time period for Filing Federal Tax Form 4868 is on or before April 17, 2018. Tax4868.com is an online portal authorized by IRS for e-filing provision of form 4868. 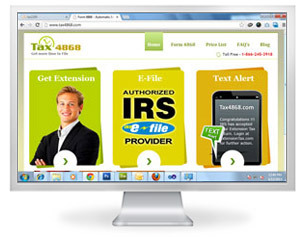 There are a lot of value-additions and benefits to Tax4868.com users. Our online tax services are designed by experts and industry leaders with more than 20 years of rich expertise in tax industry. Our online tax return filing software is a product of ThinkTrade.Inc, which is a pioneer in the tax e-filing industry. Our online tax return filing software applications are very simple and easy so that users can utilize them with extreme comfort. We update our technology and tax return services in par with the emerging changes in the industry.